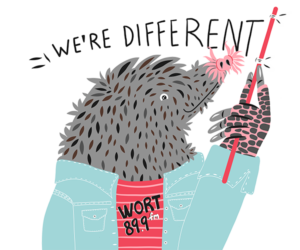 Yes, WORT is different. Unusual, out-of-the-ordinary, remarkable, quirky, and uncommon. We are different because you are different. Because of you, we are one of only 283 FCC licensed community radio stations in the United States. Thank you for being and supporting the unusual. Thank you for making a gift of support to WORT's area of greatest need. Community radio relies on its community for volunteers and financial support. WORT is grateful to have generous community members like you, who support us robustly in so many ways. Thank you!